← My Life. My Health. My Gluten Free Native Sun. Saturday Night I went to Bonefish Grill with a group of my close friends to celebrate my good friend Scott’s 30th Birthday. 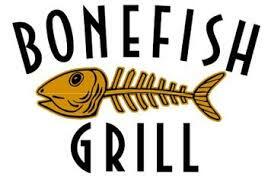 We made reservations, however on a Saturday night at Bonefish in Jacksonville reservations are a little irrelevant. I suggest getting there earlier than your reservation. After waiting about 45 minutes we were seated at 2 tables of 6 next to each other. I immediately asked for a Gluten Free Menu and was approached by who I think was the manager to ask if I would like their gluten-free bread. I said of course and then gave my speech about having celiac disease, cross contamination, yadda, yadda. However, all of my friends who are not used to dining with my very verbal dining skills were curious about the gluten-free bread so the gentleman brought out 6 loaves. I warned them that the regular bread was going to be WAY better because gluten-free bread lacks that elasticity, chewiness and flavor that the Bonefish Grill regular bread has in abundance. Everyone tried it and quickly made comments like “it tastes like a biscuit” and “it is not that bad.” I on the other hand felt relaxed and at ease as I took an entire loaf (which does look like a biscuit) and dipped pieces of the bread into my own, untouched personal oil and pesto dipping sauce. No restaurant, that I know of yet, has gluten-free bread fresh and on the table before a meal. Yeah, it is not the best for you, but when you can’t have something you really miss it and savor each bite when you do have it. I was surprised when the man who I think was the manager told me that not all Bonefish Grill restaurants offer gluten-free bread. He told me that he does it because he has a few gluten-free diners who are regulars and they have brought friends and keep bringing friends because Bonefish is so accomodating. Once he brought out the bread he couldn’t wait to tell us about their gluten-free dessert. The Gluten Free Menu is amazing, there are so many choices. Essentially it just looks like a regular menu, but with a big “GF” next to the gluten-free items. The “GF” menu is also missing its prices, I don’t know what that means, however I know it is a common trend among gluten-free restaurants and with gluten-free menus. Normally, I am with a normal eater so I just peek at their menu because gluten-free dining has gotten EXPENSIVE these days and while my spending on groceries has almost doubled my paycheck has not. Our appetizers included the saucy shrimp, a delicious gluten-free dish and one of my favorites which includes shrimp, olives, feta cheese and sun dried tomatoes (and other yummy stuff). Another one of my favorite things on the gluten-free menu is the house salad. It is cold and includes olives, tomatoes and hearts of palm (which always cause a debate for first time tasters who think it is mozzarella cheese). All of their grilled seafood dishes are gluten-free. All of the signature sauces but Pan Asian are gluten-free. All of their sides except potatoes au gratin are gluten-free. On Saturday I ordered the Anglers Steak Special with mashed potatoes which are gluten-free. They also have a gluten-free drink menu on the back of the drink menu to tell you which drinks are gluten-free. And to finish off our wonderful menu, the wait staff brought us a Macadamia Nut Brownie. In all its glory, this dessert is gluten-free. It comes with macadamia nuts, chocolate syrup and a HUGE scoop of vanilla ice cream. It is worth the indulgence because it is so yummy. They brought one out for each of our tables with 6 spoons per table. I do have some sad things to report, their ever popular “Bang Bang Shrimp” is not gluten-free. It is one of the saddest things I have ever had to deal with (besides learning almost all beers have gluten). It is their signature item and I miss it. But I have to admit, I had it plenty of times before I knew I had celiac disease so I know that it is good and I know I don’t want to feel sick. After the “happy birthday to you’s” and the polishing of all of the desserts we left the restaurant to head out for Scott’s 30th birthday on the Short Bus– gluten-free of course! That brownie dessert sounds yummy!! I went to the Bonefish on San Jose a couple months back and had the waiter ask the manager if the gluten in the bang bang shrimp came from just the fried shrimp or the sauce also. Before I knew it they’d brought out a helping of grilled shrimp with the bang bang sauce on the side. I nearly wept. I promise I’m not being creepy. Just wanted to post that I got a 100% confirmation on the Bang Bang sauce being gluten free so next time you go to Bonefish see if they’ll make you some. You just made my day!!!! Thanks for the info. The one in Mandarin on San Jose, at the intersection of 2-95. All, missing the bang bang shrimp myself due to gluten issues, I posted a gluten free knockoff on my website. Hope everyone enjoys!